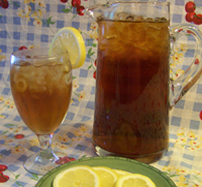 Sweet Tea is a southern tradition. I grew up drinking sweet tea and now my grown children love it too. When I have guests over, I like to leave the tea unsweetened and serve it with sugar substitute and simple syrup on the side so my guests can choose. In a small pot, boil 2 cups water. Remove from heat and add tea bags, cover and let steep for 10 minutes. Pour tea, sugar and remaining water into a one gallon container. Stir until all sugar is dissolved. Place in refrigerator until chilled. Serve over ice.